Please follow The Sporting Rave on Twitter and “Like” The Sporting Rave Facebook Page. 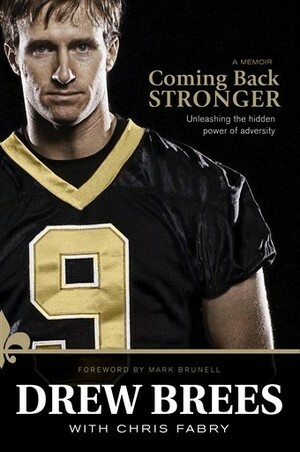 Fresh off the 18th annual ESPYs, where New Orleans Saints quarterback Drew Brees won four awards, including best male athlete, it was announced that the football stud’s new book will debut at Number 3 on the New York Times best sellers list. The book, titled “”Coming Back Stronger,” was released on July 6. Brees will go on a book tour that will consume only three days but include eight appearances in Florida, Alabama, Mississippi, and Louisiana. Brees has certainly done his fair share in promoting the book, appearing on Good Morning America, Fox’s Hannity, ESPN, and The Tonight Show with Jay Leno. The book also contains a foreword from Mark Brunell, a former quarterback of the Saints. The latest cover boy for the Madden franchise, Drew Brees, was on the Late Show with David Letterman to promote the newest EA Sports game, Madden NFL 11. The show has a “Top Ten” segment, and Brees presented the “top ten new features on Madden.” The list is humorous of course, and certainly doesn’t hold back. You gotta love the Peyton and TO lines. This was one of several talk show appearances for Brees since the Saints won the Super Bowl, as the Super Bowl 44 MVP has been on Ellen and Oprah as well. Drew Brees of the Saints, Jared Allen of the Vikings, and Reggie Wayne of the Colts were the three finalists for the Madden 2011 cover athlete, and the winner has finally been announced. Fans were able to vote online to select the winner, picking Drew Brees as the next Madden cover boy, and if you believe in the Madden curse, victim. Many think the reason for the injuries suffered by the players featured on the Madden cover are a result of the curse, but Shaun Alexander, who was featured on the cover in 2007, says that the injuries are just a normal part of the game. “People forget that 50 percent or 60 percent of the guys get hurt every year,” Alexander said in USA Today. “I tell everybody the same thing like I told Tom Brady and LaDainian Tomlinson. After I won the MVP and got on the cover and LaDainian came out the next year and had a great season and said, ‘I’m not going to get on the cover. I don’t want to get hurt.’ What’s he do? He gets hurt. Tom Brady comes out the next year after LaDainian and is MVP, doesn’t want to be on the cover and what’s he do the first game? He gets hurt. Football is a physical sport and people get hurt. Although the curse is more than likely a myth, I wouldn’t be surprised to find out that the majority of the people who voted for Brees were Colts fans.